Receiving the 2015 Triple Crown (Repeat Achiever) award. New Brunswick, Prince Edward Island, & Nova Scotia in Canada. 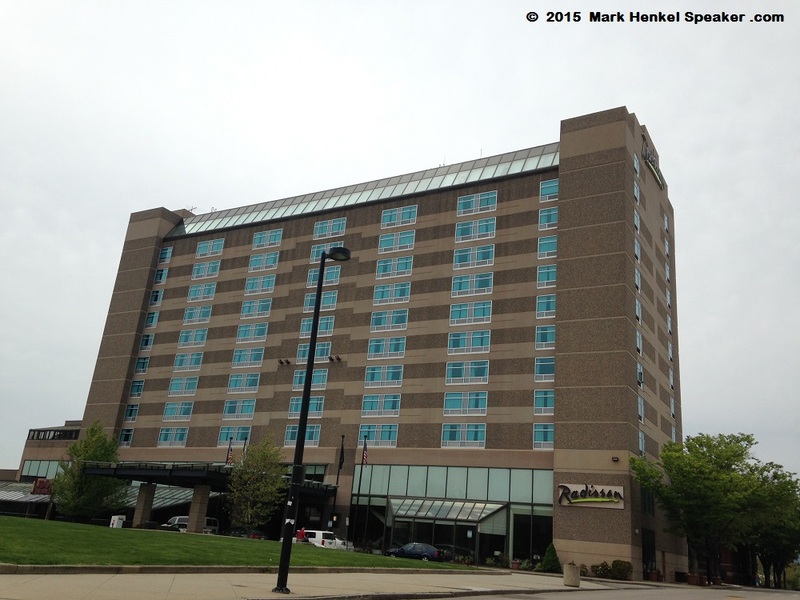 The weekend conference was entirely held at the Radisson Hotel on 700 Elm St. in Manchester, New Hampshire. 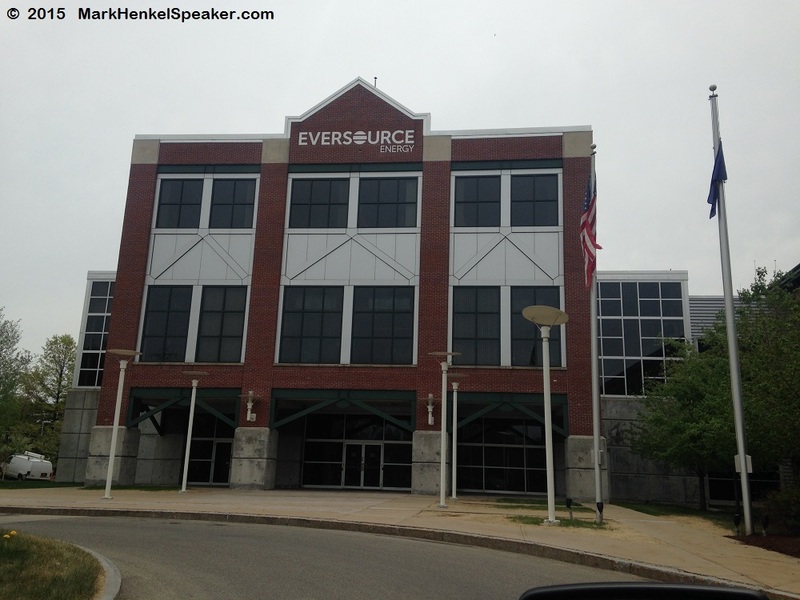 Just prior to the start of the weekend, the District also organized a special 2-hour workshop, titled, “How to Give Killer Presentations,” from 3:00-5:00p on Friday, a few blocks away at the EverSource. This additional workshop was presented by two past World Champions of Public Speaking (WCPS): David Brooks (1990) and Jock Elliot (2011). This workshop was loaded with lots of great insight. 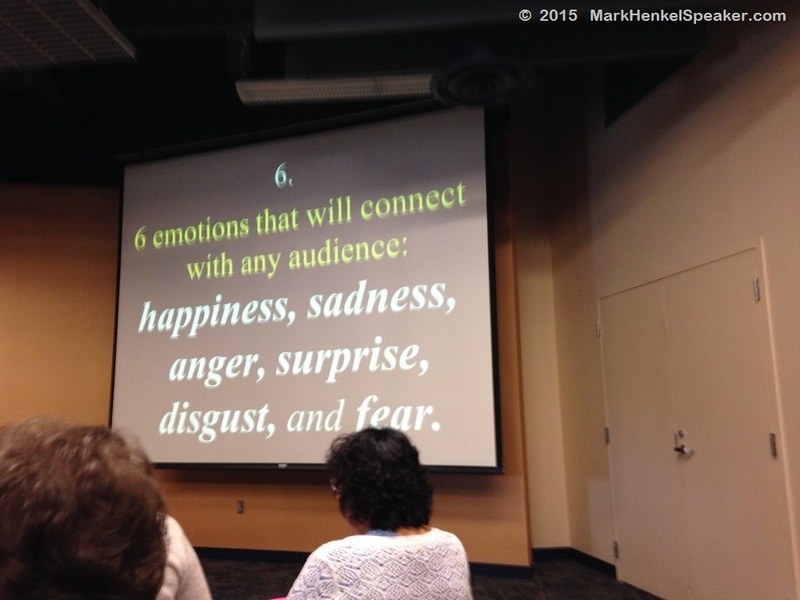 When I saw this powerpoint slide from David Brooks, I got even more enthused; it affirmed my exact strategy for the speech I would be presenting in the International Speech Contest the next day. 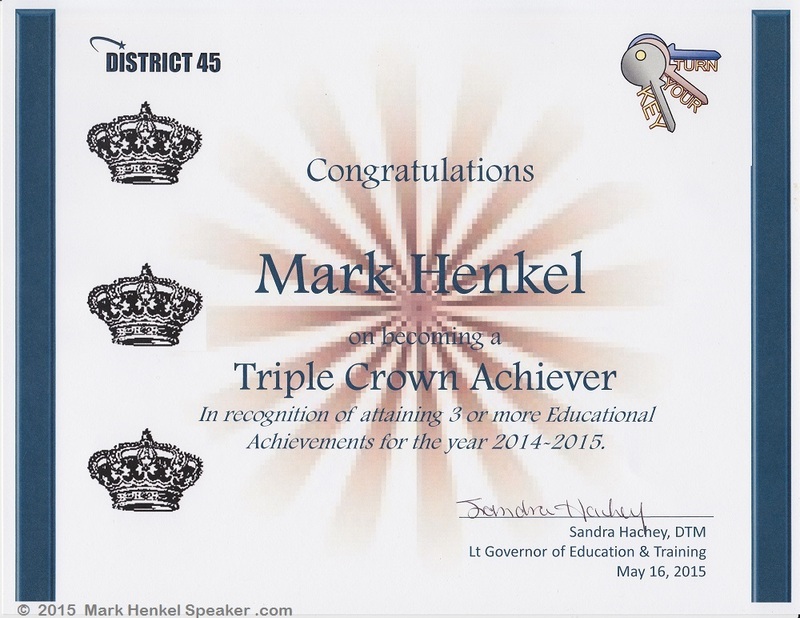 During the Saturday Awards Luncheon, I received the 2015 Triple Crown (Repeat Achiever) award (see video at link). 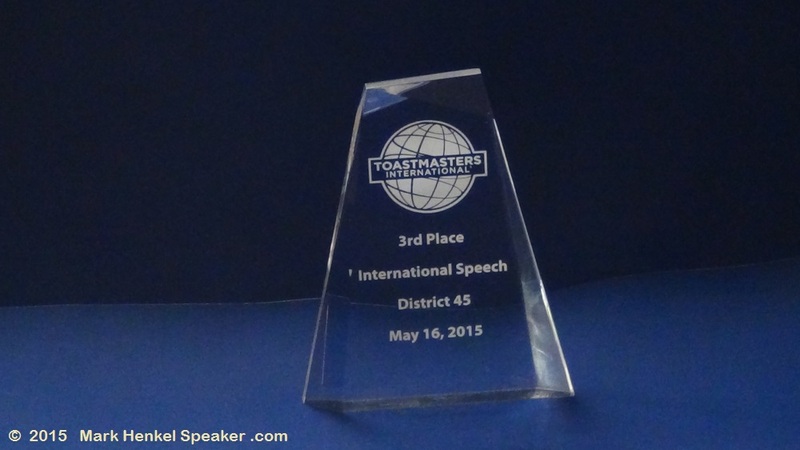 The District 45 International Speech Contest began at 5:00pm. Out of 7 contestant, I was the third to speak. My speech was titled, “Good Enough for Greatness.” Afterward, when I went to swap off the microphone, fellow contestant and good friend (who is also a Past District Governor), Dan Bell, whispered to me that he thought my “gestures were impeccable.” Except for mine and one other contestant’s speech, the other speeches were more humorous and less serious-toned. Five of the contestants definitely brought their A-game, and the other two were very close behind. The results would not be announced until later that evening. Many, many people came up to me afterward, convinced that I was going to be the winner. Some were in tears as they shared how they were moved by the speech (especially those who had shared similar tragedy in their own lives). Others just wanted to hug me in gratitude for my sharing so personal a story. My mentor and fellow contestant (who is also a previous 4-time District winner), Joe Grondin, said that, after seeing my speech (for that first time), he knew I had “brought something to win.” The Contest Chair, Debby Hoffman Adair, who is a past president of a New England chapter of the National Speakers Association, said that she “just had to hug” me and that she thinks that I should be going on tour to bring this speech to school children. Later that evening, after the Dinner Banquet, the Top 3 were announced. 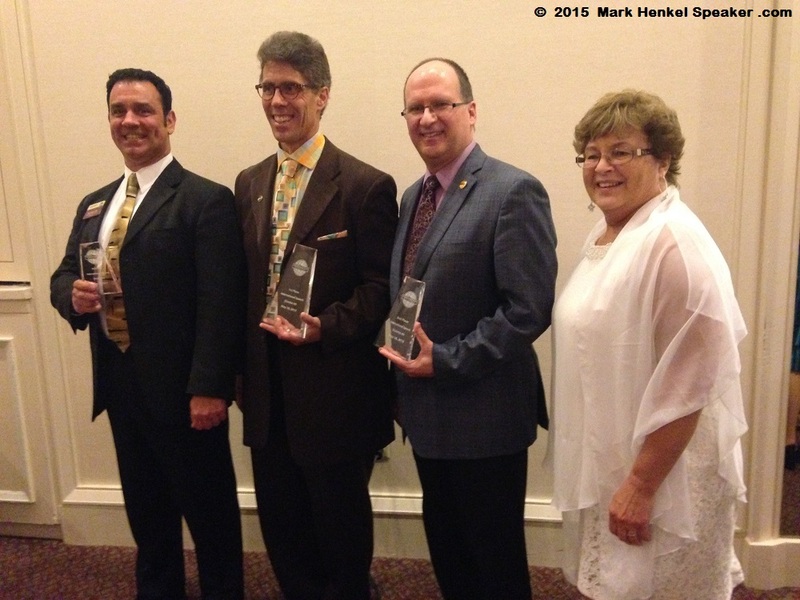 My mentor, Joe Grondin, won 1st place; my good friend, Dan Bell, had won 2nd place; and I had won 3rd place. This was truly a competitive contest. 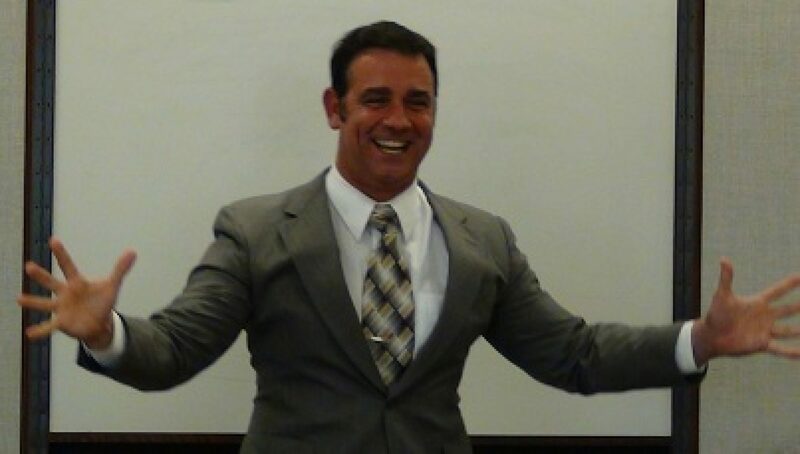 For my very first run up to this level, I had achieved my goal for this year and was happy to earn 3rd Place in the 2015 District 45 International Speech Contest (see more details at link). 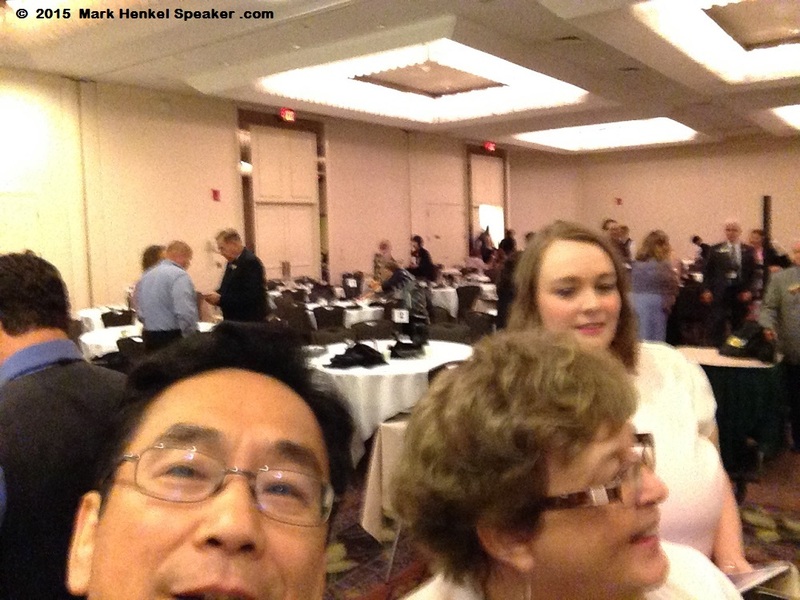 The entire weekend of the 2015 District 45 Spring Conference was truly a lot of fun. 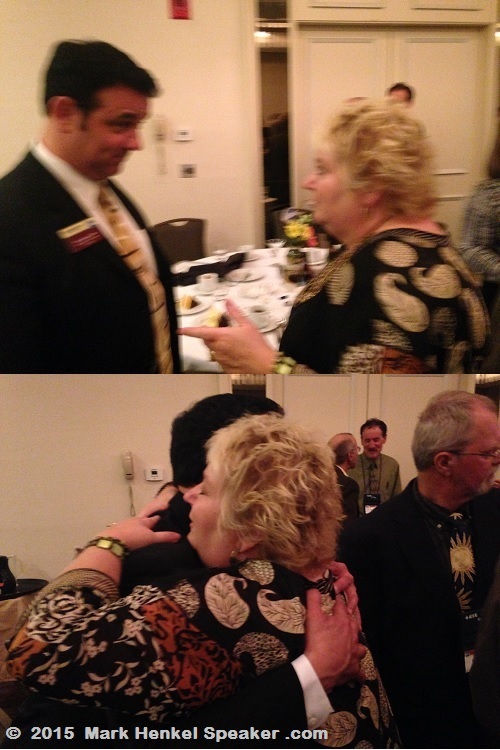 I was able to re-connect with many good friends – such as the ever-awesome and hilarious duo, Malinda Regimbal & Dan Bell. I was also able connect again with good friend (and another Past District Governor), Carl Duivenvoorden. 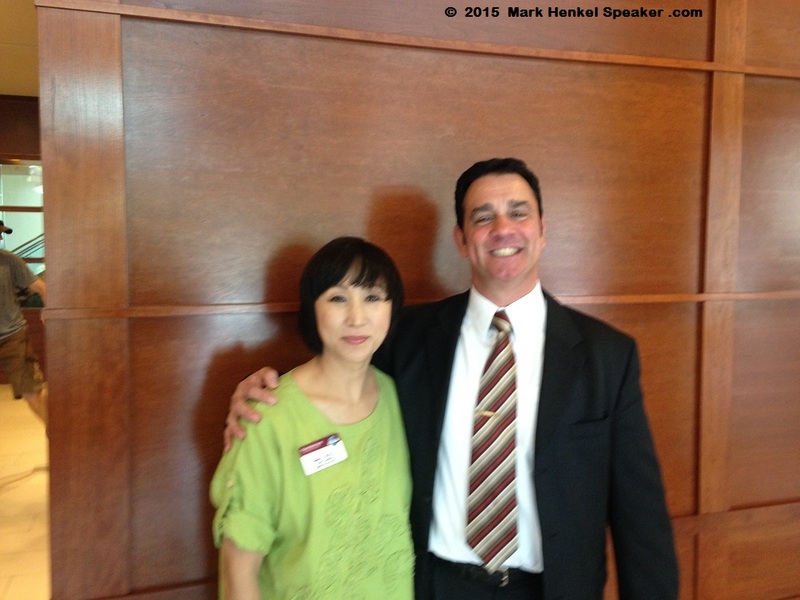 Networking and making new friends with other Toastmasters is also another super value – such as meeting the super Helen Fu. I so enjoy the fun we have. Steve Chen (who is a Region 9 Candidate seeking to be an International Director at Toastmasters International) is one of the good friends with whom I hung out at dinner. He took the pictures for me. With his great humor, it was to be expected that he would add a photo-bomb selfie! Truly, there are so many more friends & contacts who could not all be listed here. They all made this a fantastic conference for me! Lastly and most importantly of all, it was fantastic and edifying to spend time in-person with my mentor and now 5-time District Winner, Joe Grondin. 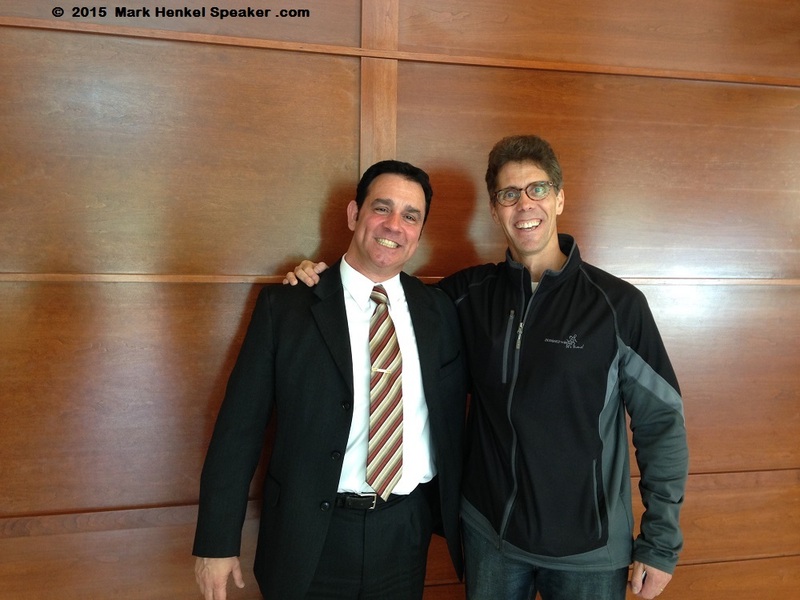 I so appreciate this man and his help for my improvement as a speaker. 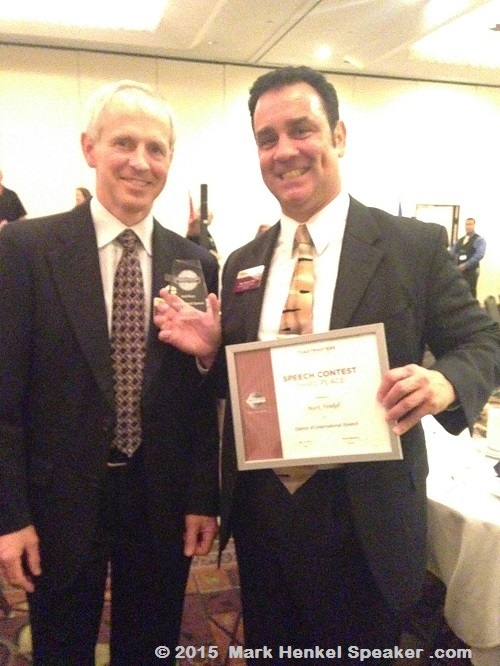 Receiving the 2015 Triple Crown Toastmasters Award (Repeat Achiever). To see more in social media, please see these links too. Feel free to FOLLOW & SHARE on social media too!